February 2015 n Performance & Hotrod Business n 63 members' vehicles, work by local and national shops and selections from Johnny Martin Enterprises, an auto dealership founded by Martin and Johnson that specializes in the purchase and sale of classic, custom and collectable cars. 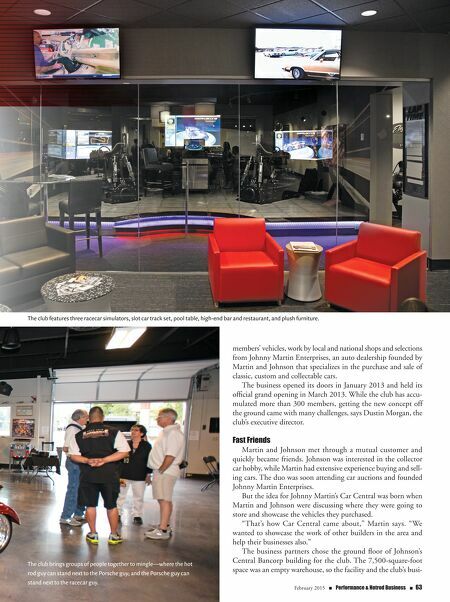 The business opened its doors in January 2013 and held its official grand opening in March 2013. While the club has accu- mulated more than 300 members, getting the new concept off the ground came with many challenges, says Dustin Morgan, the club's executive director. Fast Friends Martin and Johnson met through a mutual customer and quickly became friends. Johnson was interested in the collector car hobby, while Martin had extensive experience buying and sell- ing cars. The duo was soon attending car auctions and founded Johnny Martin Enterprises. 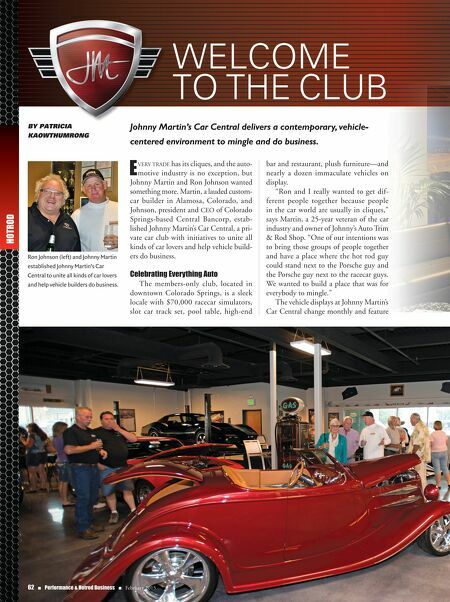 But the idea for Johnny Martin's Car Central was born when Martin and Johnson were discussing where they were going to store and showcase the vehicles they purchased. "That's how Car Central came about," Martin says. "We wanted to showcase the work of other builders in the area and help their businesses also." The business partners chose the ground floor of Johnson's Central Bancorp building for the club. The 7,500-square-foot space was an empty warehouse, so the facility and the club's busi- The club brings groups of people together to mingle—where the hot rod guy can stand next to the Porsche guy; and the Porsche guy can stand next to the racecar guy. The club features three racecar simulators, slot car track set, pool table, high-end bar and restaurant, and plush furniture.